I've been happily fermenting black, oolong, green, red, and white teas for nearly a year now with a kombucha tea scoby (Symbiotic Colony Of Bacteria and Yeast.) Carla picked up at a farmer's market back in October. Since then, with regular feedings of fresh tea, we've grown our one scoby into three scobys, one of which we gave away to Carla's mom and brother. Last month our main scoby had become so large, it was time to either cut it in half or give it a bigger home, least it become so large it overtake the entire jar. While debating my scoby's fate, Carla returned from a work event with some leftover food and a liter of Coke that someone opened only to take 1 tablespoon out. We don't usually have soda in the house, so I claimed this nearly-full liter of Coke in the name of science. In the book "Wild Fermentation" by Sandor Ellix Katz, he mentions passing his own overgrown scobys out to friends, one of whom used it to ferment Mountain Dew to create "Scoby-Dew." This has been hanging out in my mind for a while as a twinkle of possibility, but now the stars finally aligned. 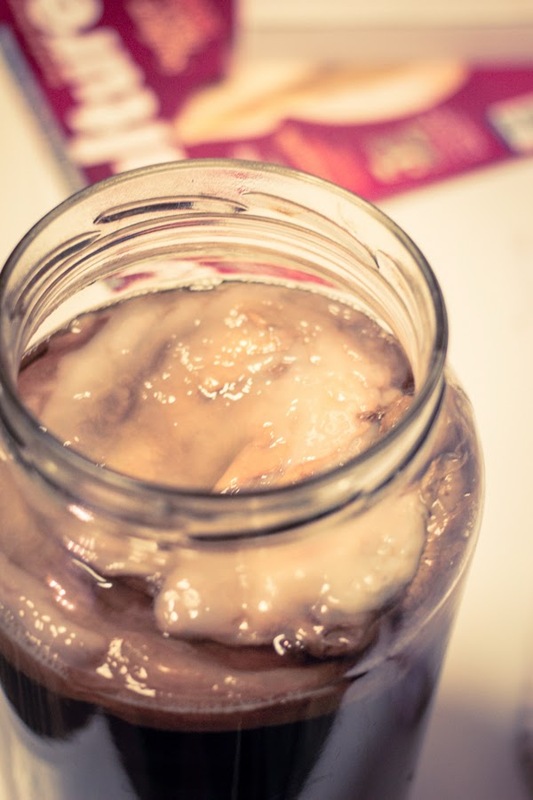 I poured the soda into a large glass jar and plopped several layers of our overgrown scoby on top. At this point I had no idea what would happen. Compared to the black tea I normally brew for kombucha, the sugar and caffeine levels for Coke are totally off the charts. After a few days, there were some small bubbles around the edge of the jar, meaning some sort of fermentation of the sugars were taking place. Perhaps this was too drastic of an environmental change for the scoby, but this fermentation took about three times longer than normal. Or it could also be that with the higher sugar content, the scoby had to work a lot harder to eat up all the Coke sugars before I could taste any of the characteristic kombucha tang or acidity. Now, nearly 8 weeks since fermentation started, I have the strangest beverage in front of me. It tastes like regular, malty Coke that's gone flat and had a splash of lemon juice added to it. It's not bad...just sorta thick and flat and not too acidic. Honestly, maybe this should have gone for 12 weeks of fermentation, but after 8 weeks, I don't think the juice - or Coke - is worth the squeeze compared to how much I prefer black tea. 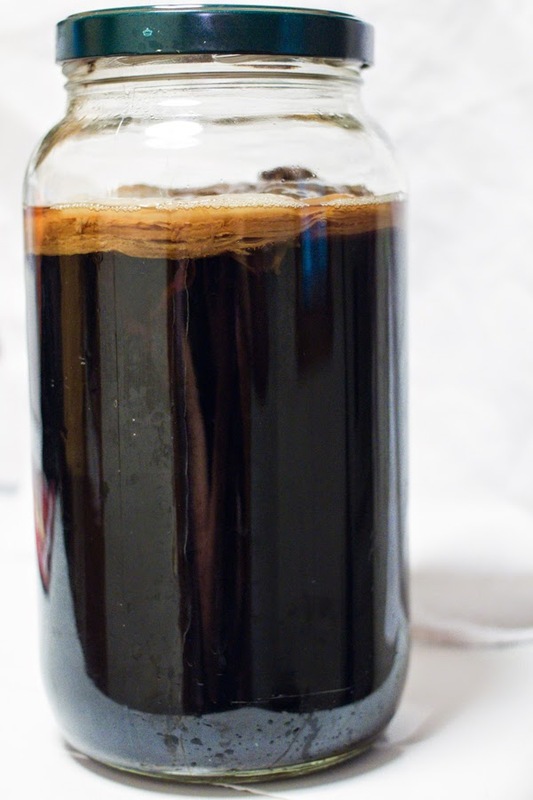 I'm trying this with ginger beer and coke but I'm doing it as a second fermentation in flip-top bottles and I'm not adding the mother, just 50/50 liquid to liquid. Should be kombucha fermentation causing bubbles by the end of two weeks. I expect I'll still lose the sodas' carbonation though. I was curious too after trying different teas and adding kombucha to some of my fermented hot sauce batches.